Cloud-Based VoIP Benefits School Communication Systems | 8x8, Inc.
Schools have ever-evolving communications needs. Students, teachers and administrators can use technological innovations to augment learning and take advantage of new opportunities. Landline-based PBX phone systems, referred to today as "plain old telephone systems," for schools provide little in the way of coordinating and integrating today's various means of communications. Unified Communications, through feature-rich VoIP systems, enable these opportunities for improved connectivity and management, with lower cost and maintenance headaches. Many schools communications systems are based on aging, legacy phone systems that either cannot provide modern communications tools, or do so in a cumbersome and disconnected manner. With an old system, school administrators have to manage two technologies, with separate cabling systems. While some may see this as a minor issue, migrating to a single technology streamlines costs related to repairs and expansion. Let's take a closer look at several of the benefits of unified school communications systems. School communications systems can be viewed from two perspectives. The first is how voice, email, messaging, video conferencing and other forms of communication can augment a student's learning experience. In the K-12 setting, students might not have a daily need for voice calls, but they increasingly rely on other forms of communication. Assignments stream in through email. Class collaboration occurs on laptops and tablets. Students can connect with various learning tools through the web. Lastly, parents can more accurately monitor their child's performance through parent portals and collaboration tools such as Google Classroom. Another perspective is how teachers and administrators utilize phone systems for schools. Here, voice calls play a more prominent role, just as in traditional school communications, but this system can be bolstered with features such as voicemail to email, web conferencing and internet faxing, in addition to integration with email, messaging and other forms of office communication. Teachers are busy. A voicemail from a parent on an old phone system is little more than a blinking light that can signal one or dozens of messages. Voicemail to email sends pertinent information immediately to the teacher, often making listening to the message unnecessary. This is one small benefit of unified communications that make a huge impact on teacher productivity. 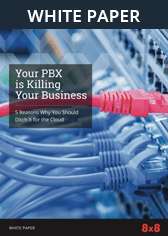 Landline phone systems and on-premises PBX systems can be costly. Equipment expenses are often high, but more importantly, its maintenance cost can be burdensome. While large school systems may have the ability to hire a technician for the in-house administration of a phone system, these resources can be put to more productive use with other technologies. VoIP ease of management and maintenance through the cloud eliminates the need for dedicated in-house staff. With cloud-based VoIP, upgrades and repairs are no longer the school's responsibility. With unified educational communications, such as the services provided by 8x8, schools can scratch phone administration off of their list of obligations, allowing an increased focus on education and innovation. The United States government recognizes the learning benefits of communication innovation and has provided sources of funding through the E-Rate program. 8x8 is a participant in this program, which includes VoIP as an eligible service in addition to broadband networking improvements and Unified Communications solutions. While increasing educational tools through the use of Unified Communications is an ideal goal, educational systems continuously struggle with funding. Since cloud-based Unified Communications lowers costs in several areas, and since there are available funding opportunities, moving away from an obsolete form of communication has never been easier or more necessary. VoIP technology is not new, having been adopted by businesses over the past two decades. However, Unified Communications continues to evolve, providing new benefits that are especially important to education. Soon enough, technologies such as artificial intelligence, faster networks, and smarter voice assistants will push plain old telephone systems into their graves. These new technologies are incompatible with old systems. Rather than working with a patchwork of old and new technologies, schools can fully integrate modern communications. The innovations of today and the horizon all work together with the Unified Communication framework, so there is no concern about VoIP becoming obsolete anytime soon.